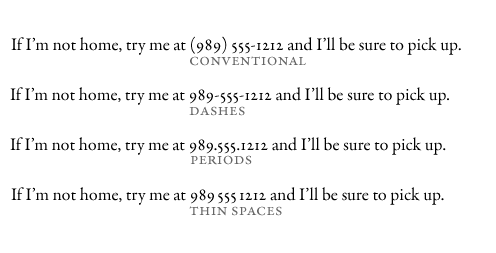 Here are four approaches to styling phone numbers. Which looks best to you? Lately I’ve been thinking about formatting phone numbers. Of course, there are plenty of options in addition to the ones above, but these are some common ones, although the thin spaces option is perhaps not too common. I added it because I’ve been wondering about the value of the separator characters, and if we can just not use them in favor of a little white space. Here is some of the thinking. The conventional formatting of (123) 456-7890 will obviously be a phone number to most Americans. I’m no fan of the dashes. I’m okay with the periods. However, are they needed? Which led me to try the version with thin spaces between each set of digits. I like the thin spaces, but I don’t dislike the conventional version. So, for obviousness, I lean towards the convention. For aesthetic, I lean towards the thin spaces. But part of the decision of which approach to go with will depend upon the context. For instance, is the phone number labeled with an obvious word like Telephone or Phone? If so, I might opt for the thin spaces version. However, if the context is unclear, say in the absence of clear cues about what that number is, the conventional approach would be best. Otherwise, the number could be misinterpreted as some other number, or it might simply take the reader too much mental effort to recognize it as a phone number. No need for that sort of rudeness. Clearly, this is all just my opinion. Do you have a preference for how phone numbers ought to be styled? I have a preference. If I am honest, the intensity of my preference is probably disproportionate to the topic. I am an ardent proponent of the period as a phone number separator. The small spaces don’t provide adequate separation for me to see the number as anything other than a jumble. The periods, for me, provide more definitive breaks thereby rendering the phone number more readable. Previous Previous post: How can MI UPA, IxDA groups, and MichiCHI work together?